Submitted by akreider on Tue, 03/19/2013 - 16:54. The third most important part of Philadelphia property is the multi-family category. So far I haven't seen much analysis of this segment. -My proposal - 1.45 rate with a $30,000 property exemption (though I'm not sure if this a good idea for multi family - I might want to limit it to residential and commercial properties). While a property exemption looks progressive, what would be the most fair is to have a Unit Exemption. It doesn't make sense to penalize large apartment owners as that will penalize the renters. So the most progressive tax would be one that taxes expensive apartments more. 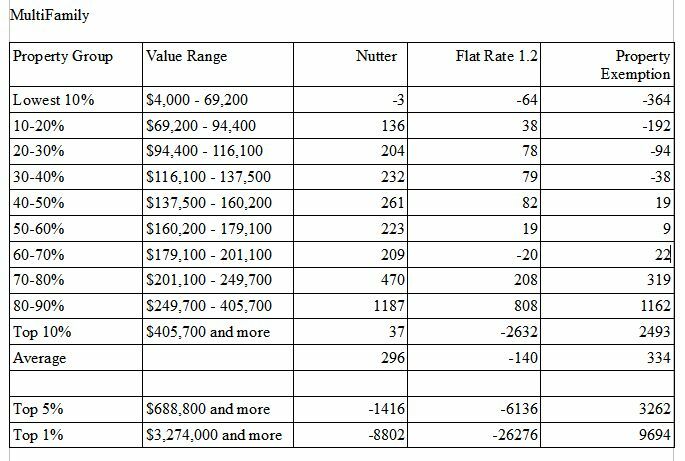 If fewer people live in an apartment than a typical home it might make sense to lower the Unit Exemption (say $20,000 instead of $30,000) -- or it might not. My data set doesn't have the number of units in a property so I was unable to look at a Unit Exemption. So take the results below with a grain of salt. 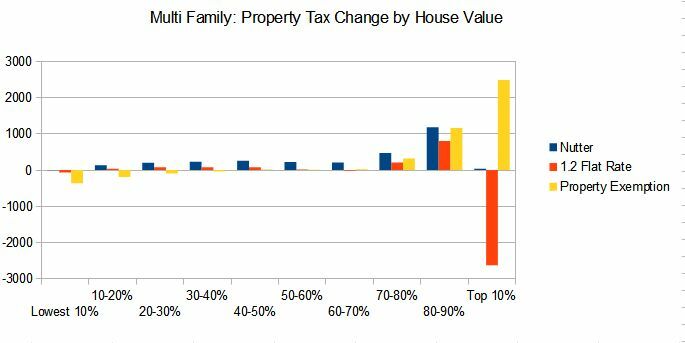 You can see that the property exemption is the only one that increases taxes on the top 10% of properties, and it also reduces taxes on the bottom 40%. The top 5% and especially the top 1% of multi-family properties stand to receive large tax cuts if Nutter's proposal or Kenney's proposal is adopted.